Touch screens offer direct and intuitive access to software, ideal for many learners. The Inclusive Touch PC brings the benefits of touch screen technology to a robust, all-in-one computer classroom solution. 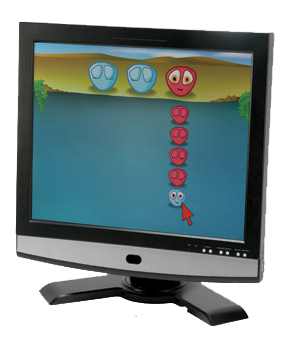 For a considerable saving over the cost of a separate touch monitor and computer, you will have a ready to use system complete with MyZone, an easy to use desktop application, and a selection of other great Inclusive software titles. Also, to ensure ALL learners are included, check out the Access Bundle option. The Inclusive Touch PC comes complete with over $500 worth of excellent Inclusive software. The titles included are: Choose & Tell Nursery Rhymes, Target & Touch Patterns, Mouse Skills, MyZone, and Big Bang. ALL Inclusive Touch PC – software and access bundles. The ALL Inclusive Touch PC includes over $800 worth of alternate access solutions from the excellent wireless “Simply Works” range as well as the software bundle (above). Now ALL students can use the computer, either by touch, switches, joystick or keyboard, and all without wires! Simply Works products included are: Two it-Switches, it-Receive, it-Stick and it-Keys. Shipping is $50 per system.